As always, traveling expands my horizons more than an elevating hot air balloon. Trekking the +80 mile-round-trip hike from Lukla to Everest Base Camp reinforced the trivial revelation that my life in America is not that difficult. I don’t have to tend to the land, I don’t have to herd cattle up precarious, cliff-hanging steps, and I certainly have not borne much weight on my untaxed shoulders compared to other people on this planet. The Nepalese, let alone the Sherpas themselves, live a life of grit, day in and day out. If the world were plunged into the Stone Ages at the blink of an eye, I’d probably die fairly quickly due to my lack of knowledge of basic survival skills. The Nepalese would be around for many many years to come, no matter the weather or oxygen levels outside. Did someone say oxygen? I can’t remember either. My brain isn’t getting enough of it to think. Up near Base Camp, we were getting 47% less oxygen than we would get at sea level. That’s not good. Imagine wanting, craving a bacon cheeseburger but all that came out was a half portion. You might throw a fit. That’s what your body does when it inhales asking for a full dose of oxygen and it only gets half of it. Never in my life has rolling over in bed been difficult, but never in my life have I laid down above 17,000 feet. Hyperventilating while laying at rest was an experience I will not soon forget. I had a backpack filled with a few cold weather items and 2 liters of water. That got heavy. Our porters would pass us walking uphill with three – yes, three – giant packs attached to their backs. The engineering done to tie the three packs together was enough to deserve its own accolade. Oh, and the porters routinely wore beach sandals or Crocs. Even on the last day I would shake my head in complete confusion at the strength of the porters. Their brawn closely resembled that of ants in that they could lift about six times their body weight. 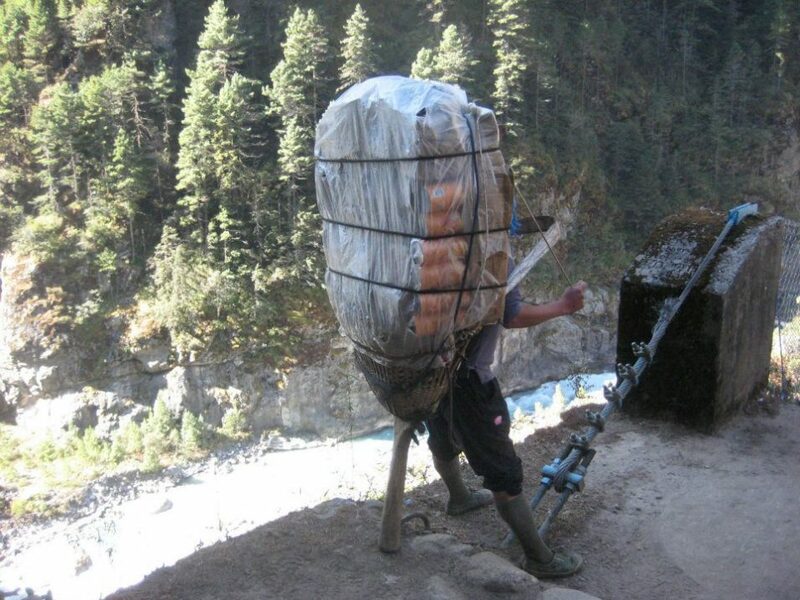 I learned that porters carried between 80-100 kilos at a time. This thought alone made me tired and thirsty so I sucked on some water to reduce the weight I had to carry. If you know your geology at all, you’ll remember that the Indian plate moved northwards and slammed into the Eurasian plate many millions of years ago. This collision and subsequent continuous movement northwards of the Indian plate spawned the Himalayas. By the site of these mighty peaks I can only assume that the Indian plate was furious with the Eurasian plate. Maybe the Eurasian plate insulted the Indian plate, maybe it stole its girl, maybe it killed its family. Whatever happened, the Indian plate must have had motive to react so because when you lay eyes on these raw, unforgiving, mountains popping up around you from all 360 degrees, you can’t help but look in wonder at what the earth has created. My feet hang over Everest. That goodness for trigonometry. There are times that the Everest Base Camp trail becomes so overcrowded that you actually have to stop and let other people pass at narrow points. There are also other points on the trail that if you don’t get out of the way that very second, you will be rammed into by a yak. Yaks share the trail with you from Lukla to Base Camp. You must always have your ears peeled for the unmistakable bells of the yak. If you hear them coming, make way. Picture this. It’s cold, like below freezing cold. You’re laying in bed with your snow hat, thermals, wool socks and whatever else you need on to stay warm within the plywood-thick walls. You need to go to the bathroom. The bathroom is home to a hole where all human waste ends up going. Imagine trying to squat over this hole while relieving yourself. Remember, there’s 50% less oxygen than normal. Obviously, men have to use the squatting method half the time while women have no other alternative no matter the reason for the trip to the toilet (sorry ladies). Trying to squat and balance over a hole while not being able to breathe fully was one of the most difficult things to do on the trip. It’s high-altitude, cold weather pilates. Good luck. If you want to continue to be on a low carb diet and climb to Everest Base Camp, I wish you all the luck. First of all, pretty much everything on the menu at every stop you make will be either rice, pasta or potatoes. The portions are good but be ready for Operation: Redundancy. Secondly, you are burning way too many calories during the day to skip on any carbs. I ate everything I could get my hands on during the trek and I still lost 15 lbs while I was away. Carb up, stay up and hold on tight. In Nepalese, this means, “Slowly, slowly.” This is the only word that goes through your head while walking up hill. Actually, you’re wondering if you could go even slower but then the porters might lose total respect for you if they hadn’t already. On the morning of October 21, 2011, we were greeted by a blizzard. This was supposed to keep us on our butts and not able to attack the peak of Kala Patthar at 18,196 feet. Someone forgot to tell that to the Human Spirit. Four of us braved the elements at 4:30AM and trekked to the top of Kala Patthar in the driving snow even as our water reserves froze on the way up. We could have quit at any time and Lord knows we wanted to at every step. But the 4 of us wouldn’t let any of us quit. Inch by Inch we got closer. A fifth of the way soon became a quarter. A quarter became a third. I heard our guide say that we were 30 minutes from halfway. I told the group that we were halfway. Thirty minutes later when we hit halfway and the group looked at me a little confused, I said, “We’re halfway now. We can’t quit.” Through the snow, through the ice and through the wind we made it to the top. We had no view, no one else to share it with and no photos to show everyone what they missed. But we had the moment. It’s the moment that no one can ever take away from the 4 of us. It’s a moment that we can always look back to when we need motivation. We did it because we could. We did it because that was the goal for the day. It’s funny what a group of people can do when a goal is united before them.